Most newcomers to indoor growing understand the importance of investing in good quality LED grow lights. What usually gets in their way is the insanely high cost of LED lights. However, you can still run your operation with LEDs if you’re not aiming for the top brands. 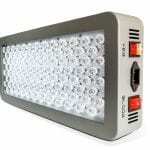 This LED grow light review focuses on King Plus 1000W LED. An effective grow light at an affordable price. 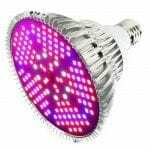 We are not going to tell you that it is a premium LED grow light. Yet, for an affordable LED grow light, it does a great job! Investing in the King Plus 1000W LED grow light means that you can enjoy the benefits of LED lights without going way over your budget. It’s the perfect light for newcomers and growers expanding their indoor growing operations. This cheap LED grow light’s price can be its own downfall. People sometimes judge the light based on its price tag. Despite the price, this LED grow light does a great job. Interested in the King Plus 1200W? Check out this review. We also reviewed the King Plus 600w, if you’re interested. Most growers go for alternate lighting methods such as HID systems, because most LEDs are beyond their budgets. However, the King Plus 1000W LED costs less than a HID system and still enables you to enjoy less operational costs with low energy consumption and low heat generation. This affordable LED grow light generates the light of a 400W bulb by consuming only 180W. That’s around 80% energy savings for the same yields. 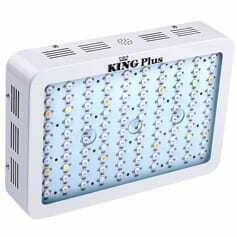 King Plus 1000W LED grow light provides the full spectrum of light that your plants need for varying stages of growth. 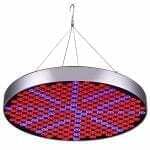 It’s not just energy efficient; it’s very effective with red and blue lights as well as ultraviolet and infrared radiations. There’s a good reason behind the purple or pink light that these affordable LED grow lights emit. They simulate the natural sunlight that your plants love. That is what makes the King Plus 1000W LED grow light suitable for both vegetative and blooming stages of your plants. The infrared lights promote cell division and the ultraviolet lights disinfect. This paves the way for happier and healthier plants. The King Plus 1000W uses 10-watt diodes. These ensure good PAR values for areas of approximately 3 by 3 feet from a height of around 24 inches. This smart breakdown of wavelengths emits a light ratio ideal for all stages of plant growth. It also boosts the quality of your harvest. 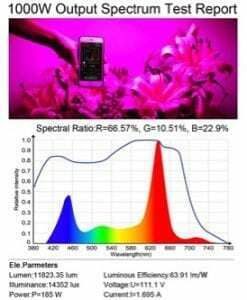 The spectrum of the King Plus 1000W LED is better than many other LEDs, fluorescent bulbs, sodium lamps and metal halide lights out there. If you take a closer look at the diodes, you might notice that they are different from standard diodes on other LED grow lights. That’s because this cheap LED grow light is equipped with powerful ‘Double Chips’. Standard LED grow lights use 3-watt diodes. 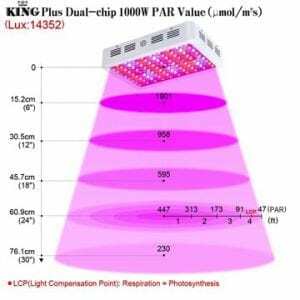 The King Plus 1000W LED grow light consists of chips with two 5-watt diodes. This unique set up gives it the ability to emit light that is twice the brightness of a standard LED grow light. You’re correct to speculate that these powerful diodes have a good chance of burning your plants. You have to use that light correctly to prevent that. Do no place the light too close to your plants. There is also a chance of your light burning out. However, there are Zener Protectors for each diode of King Plus 1000W grow light. They make sure diodes are resistant to burning out. The Zener protectors will also prevent the entire lamp from burning out in case one single diode burns out. In reality this Zener Protection does not work that great. I have experienced a burnout within the first year of using this light. There’s a good reason why most LED makers out there don’t push beyond 3 watt or 5 watt diodes. A 10-watt double chip produces quite a lot of heat. That means an effective cooling system must be in place to handle the high heat output. 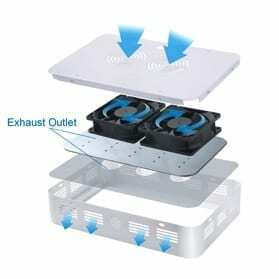 King Plus has successfully tackled this problem with some smart cooling mechanisms. The thicker than usual board (3mm compared to 1.6mm) with holes in it increases heat dissipation. There are multiple heat sinks to draw heat away from the diodes. The two high quality fans blow air over those heat sinks for better cooling. 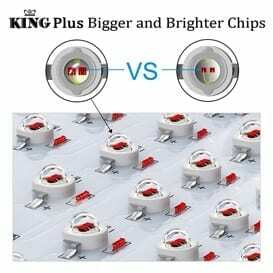 The cooling techniques of the King Plus 1000W LED grow light has increased the life span of the diodes. Also, it reduces the chance of them burning out. It’s true that a King Plus 1000W LED grow light is cheap. However, it’s important to find out how much of your growing area that it can effectively cover. You might need multiple lights depending on the scale of your indoor growing operation. This affordable LED grow light can cover an area of 3.4 feet by 3.8 feet. Depending on the size of your grow room, you will have to calculate how many of these LED units you’re going to require. The King Plus 1000W LED grow light comes with hanging hooks, so it’s fairly easy to suspend and adjust according to your requirements. There are metal eyelets on the top surface of the panel to which you can clip those hooks. 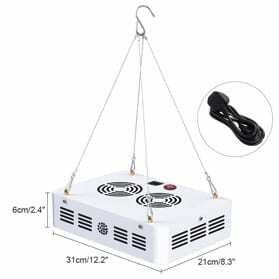 Finding the ideal height to suspend this cheap LED grow light from the canopy of your plants needs a bit of trial and error. King Plus generally recommends positioning it at a height of 1.2 to 2 meters from the canopy. However, it’s a good idea to adjust this height according to the growth stage of your plants. You may not want to suspend the LED panel too close to the canopy during cloning stage. During the vegetative stage though, bring thee LED panel closer to about 24-36 inches. The blooming phase of your plants demand a lot of light. Therefore it’s a good idea to bring the panel further down to 15-20 inches during this time. It’s important to observe how your plants respond with these adjustments. Don’t hesitate to re-adjust if they are not responding well. This affordable LED grow light comes with a 3-year manufacturer’s warranty. That makes it a risk-free purchase as you can get your light replaced or repaired if something goes wrong. The King Plus 1000W LED comes with a hanging kit and a power cord. That means you can get started growing under this light in quick time. 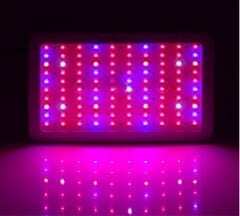 This cheap LED grow light is not suitable for serious or large scale growing operations. There are way better 400W LEDs out there provided for a higher price. Considering the pros and cons of King Plus 1000W LED grow light, it sure is a great option for a beginning grower. It’s also a viable choice if you’re looking to expand without spending a fortune. There are decisions to be made though. There’s a possibility of failure which might cost you time. The quality that you get is equal to the price. If you don’t have a back-up plan, you might be in trouble. Under this LED grow light review, we want to mention that expecting this grow light to be an equivalent of a 1000W light is not realistic. It does the same job that a 400W HID light does. For the price, that’s still great value! Are you looking for a premium-quality LED light? Take a look at our review of the G8LED G8-900!